Impact Genetics > Testing Services > BAP1 Tumor Predisposition Syndrome (BAP1-TPDS) > What is BAP1-TPDS: Info for Patients & Clinicians. BRCA1–associated protein 1 (BAP1) is a gene located on chromosome 3. BAP1 is an important “good” gene. It is a tumor suppressor gene. The role of BAP1 is to protect the cell from replicating at an increased rate. All human beings have two copies of the BAP1 gene; one inherited from the mother and one from the father. In order for BAP1 to lose its ability to control cell growth it must lose both working copies. This can happen by random chance when both copies of the gene obtain a mistake (mutation). These are called “somatic” mutations and are not inherited through the family. It can also happen when a person is born with a mistake in ONE copy of their BAP1 gene (in every cell of their body) then obtains a mutation in their second (working copy) causing BAP1 to lose its function. A BAP1 mutation that someone is born with is called “germline”. Germline mutations are typically inherited from a parent and can be passed along to children. 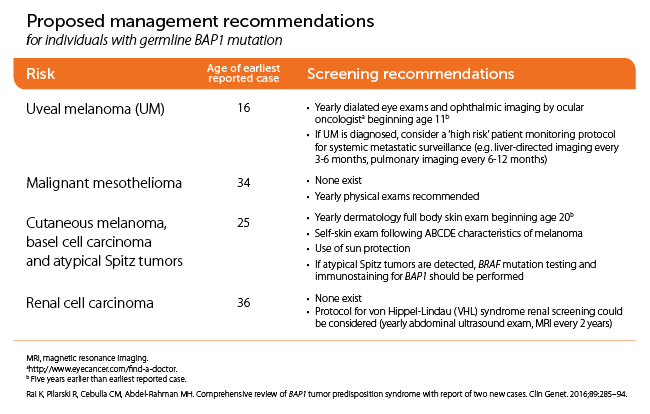 Mutations in BAP1 cause a novel cancer syndrome which is characterized by early age onset of benign melanocytic skin tumors, and later in life by a high incidence of mesothelioma, uveal melanoma, cutaneous melanoma, renal cell carcinoma and additional cancers. Individuals that carry an underlying BAP1 germline mutation are at lifelong risk for BAP1 related tumors. 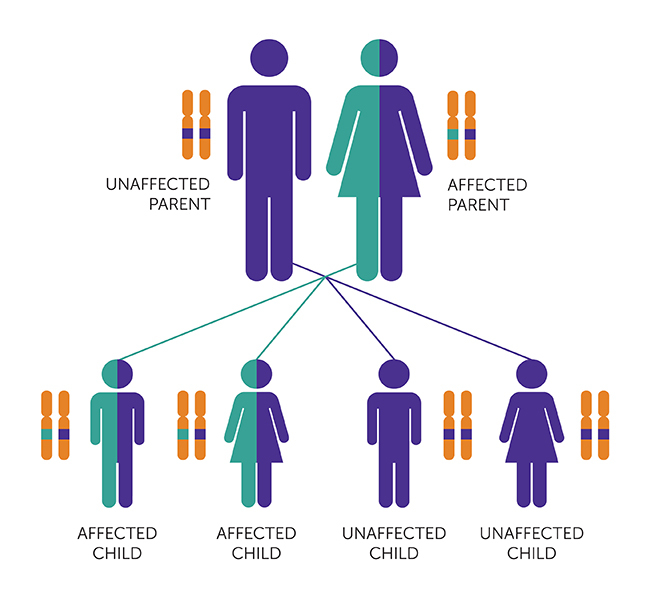 BAP1 carriers have a 50% chance to pass this gene mutation to each of their children. Uveal melanoma tumor cells can often demonstrate a lack of BAP1 expression due to chromosome 3 loss which has been linked to a higher risk of metastasis. Typically these BAP1 changes in the tumor are somatic (not inherited through the family). The majority of uveal melanoma tumor cells that show lack of expression of the BAP1 protein are caused by the loss of chromosome 3 which happens by random chance (somatic). In these circumstances BAP1-TPDS is not the cause of the BAP1 abnormality in the tumor. In a smaller percentage of uveal melanoma patients the tumor can show lack of BAP1 expression which could be linked to an underlying (germline) BAP1 mutation inherited from a parent. The prevalence of germline BAP1 pathogenic variants in unselected individuals with uveal melanoma is 1%-2% (Aoude et al 2013); in contrast, the frequency is 20%-30% in persons with uveal melanoma who have a family history of uveal melanoma (Popova et al 2013, Gupta et al 2015, Turunen et al 2016). Because of the increased aggressiveness of BAP1-TPDS-related uveal melanoma, all uveal melanomas should be managed as the more aggressive tumors (Njauw et al 2012). Genetic counseling is the process of providing individuals and families with information on the nature, inheritance, and implications of genetic disorders to help them make informed medical and personal decisions. A discussion with your health care provider is recommended to determine if you or your family member may benefit from genetic testing for BAP1-TPDS. A referral for genetic counseling can be initiated from your family doctor or medical specialists.